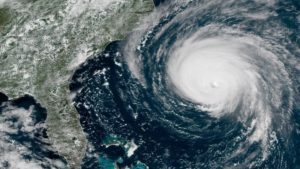 What crisis management lessons can a disaster like Hurricane Florence provide to organizations and the PR pros who support them? Recently, I flew into North Carolina to help a friend with what started as a small, rural nonprofit dealing with the aftermath of Hurricane Matthew. My friend saw a need and stepped in — using her natural gifts and savvy about people — to grow the organization to be a key player in her county during Hurricane Florence. Our PR Challenge: Staying “rural relevant” while quickly getting the organization “more sophisticated” in media relations and big-time grant opportunity development. After my years of working with government and nonprofit systems, it was rewarding to help a friend take their next steps to helping her community and growing the nonprofit — despite the aftermath of the hurricane. They have mitigated mosquitos, mud and messes. From disaster and crisis can come opportunity. There is a good reason that in the Chinese language the same word is used to mean crisis and opportunity. It’s true — and on our worst days we must keep it in mind. As communicators and strategists, we must help our organizations find those opportunities and develop the new, thriving normal. Be clear on your goals and priorities. In the aftermath of a crisis or disaster there is so much to do. It is overwhelming but it must be prioritized. Sometimes the less glamorous items must take priority. I wish I could tell you we created a new logo, tagline and website. We did none of those things, but with relationships and stories we are leveraging them to get new funds. And then, those things will come in the future. Setting a new, stronger foundation is critical. Rebuilding — or creating communications systems for an organization addressing a crisis or disaster in process — may mean having to make choices on what can really be done now. But, always look to make those choices through the lens of what strategies and activities are foundational. This will reap dividends in future communications and relationship building. Make relationships actionable and long lasting. People and organizations come together in a crisis — but do they stick together in the aftermath and for the future? Usually they should. Often they don’t. Create a plan that builds relationships designed to be relevant and productive for years to come. PRConsultants Group member Shelly Holmes is president of Holmes Associates, a full-service marketing communications consultancy that “best fits” a team and resources to meet client goals and budgets. As an award-winning marketing communications veteran, she has overseen large budgets, complicated projects, and milestone efforts with companies such as Anthem Blue Cross, Raytheon, TIAA-CREF, DIRECTV, First 5 California, County of LA and more. She and her teams are experienced in a variety of sectors including healthcare, environment, higher education, consumer products and more.